This article is about the Middle Eastern ethno-religious group. For the Gnostic religious belief, see Mandaeism. Mandaeans (Arabic: الصابئة المندائيون‎, translit. aṣ-Ṣābi'a al-Mandā'iyūn) are an ethnoreligious group indigenous to the alluvial plain of southern Mesopotamia and are followers of Mandaeism, a Gnostic religion. The Mandaeans were originally native speakers of Mandaic, a Semitic language that evolved from Eastern Middle Aramaic, before many switched to colloquial Iraqi Arabic and Modern Persian. Mandaic is mainly preserved as a liturgical language. In the aftermath of the Iraq War of 2003, the indigenous Mandaic community of Iraq, which used to number 60,000–70,000 persons, collapsed; most of the community relocated to nearby Iran, Syria and Jordan, or formed diaspora communities beyond the Middle East. The other indigenous community of Iranian Mandaeans has also been dwindling as a result of religious persecution over that decade. There are several indications of the ultimate origin of the Mandaeans. Early religious concepts and terminologies recur in the Dead Sea Scrolls, and "Jordan" has been the name of every baptismal water in Mandaeism. The Mandaic language is a dialect of southeastern Aramaic and is closely related to the language of the Babylonian Talmud. There is archaeological evidence that attests to the Mandaean presence in pre-Islamic Iraq. Some scholars, including Kurt Rudolph connect the early Mandaeans with the Jewish sect of the Nasoraeans. A number of ancient Aramaic inscriptions dating back to the 2nd century CE were uncovered in Elymais. Although the letters appear quite similar to the Mandaean ones, it is doubtful whether the inhabitants of Elymais were Mandaeans. Under Parthian and early Sasanian rule, foreign religions were tolerated. The situation changed by the ascension of Bahram I in 273, who under the influence of the zealous Zoroastrian high priest Kartir persecuted all non-Zoroastrian religions. It is thought that this persecution encouraged the consolidation of Mandaean religious literature. The persecutions instigated by Kartir seems to temporarily erase Mandaeans from recorded history. Traces of their presence can still however be found in the so-called Mandaean magical bowls and lead strips which were produced from the 3rd to the 7th centuries. The Mandaeans re-appear at the beginning of the Muslim conquest of Mesopotamia, when their "head of the people" Anush son of Danqa appears before Muslim authorities showing them a copy of the Ginza Rabba, the Mandaean holy book, and proclaiming the chief Mandaean prophet to be John the Baptist, who is also mentioned in the Quran. The connection with the Quranic Sabians provided them acknowledgement as People of the Book, a legal minority religion within the Muslim Empire. They appear to have flourished during the early Islamic period, as attested by the voluminous expansion of Mandaic literature and canons. Tib near Wasit is particularly noted as an important scribal centre. Yaqut al-Hamawi describes Tib as a town inhabited by Nabatean (i.e. Aramaic speaking) Sabians who consider themselves to be descendants of Seth son of Adam. The status of the Mandaeans became an issue for the Abbasid al-Qahir Billah. To avoid further investigation by the authorities, the Mandaeans paid a bribe of 50,000 dinars and were left alone. It appears that the Mandaeans were even exempt from paying the Jizya, otherwise imposed upon non-Muslims. Early contact with Europeans came about in the mid-16th century, when Portuguese missionaries encountered Mandaeans in Southern Iraq and controversially designated them "Christians of St. John". In the next centuries Europeans became more acquainted with the Mandaeans and their religion. The Mandaeans suffered persecution under the Qajar rule in the 1780s. The dwindling community was threatened with complete annihilation, when a cholera epidemic broke out in Shushtar and half of its inhabitants died. The entire Mandaean priesthood perished and Mandeism was restored due only to the efforts of few learned men such as Yahia Bihram. Another danger threatened the community in 1870, when the local governor of Shushtar massacred the Mandaeans against the will of the Shah. As a result of these events the Mandaeans retired to the more inaccessible Central Marshes of Iraq. Following the First World War, the Mandaeans were still largely living in rural areas in the lower parts of British protected Iraq and Iran. Owing to the rise of Arab nationalism, Mandaeans were Arabised at an accelerated rate, especially during the 1950s and '60s. The Mandaeans were also forced to abandon their stands on the cutting of hair and forced military service, which are strictly prohibited in Mandaenism. The 2003 Iraq War brought more troubles to the Mandaeans, as the security situation deteriorated. Many members of the Mandaean community, who were known as goldsmiths, were targeted by criminal gangs for ransoms. The rise of Islamic Extremism forced thousands to flee the country, after they were given the choice of conversion or death. It is estimated that around 90% of Iraqi Mandaeans were either killed or have fled after the American-led invasion. The Mandaeans of Iran lived chiefly in Ahvaz, Iranian Khuzestan, but have moved as a result of the Iran–Iraq War to other cities such as Tehran, Karaj and Shiraz. The Mandaeans, who were traditionally considered as People of the Book (members of a protected religion under Islamic rule) lost this status after the Islamic Revolution. Local authorities in Iranian Islamic Republic are known to encourage harassment and persecution of the Mandaeans. However, despite this, Iranian Mandaeans still maintain successful businesses and factories in areas such as Ahwaz. In April 1996, the cause of the Mandaeans' religious status in the Islamic Republic was raised. The parliament came to the conclusion that "Sabaeans" were included in the protected status of People of the Book alongside Christians, Jews and Zoroastrians and specified that, from a legal viewpoint, there is no prohibition against Muslims associating with Mandaeans, who are often regarded as being the Sabaeans mentioned explicitly in the Quran. That same year, Ayatollah Sajjadi of Al-Zahra University in Qom posed three questions regarding the Mandaeans' beliefs and seemed satisfied with the answers. These rulings however, did not lead to Mandaeans regaining their more officially recognized status as People of the Book. 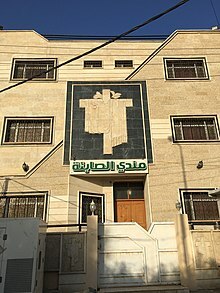 Pre-Iraq War, The Iraqi Mandaean community was centered in Baghdad. The Mandeans originate, however, from southern Iraq in cities like Nasiriyah. Many also live across the border in Southwestern Iran in the cities of Ahvaz and Khorramshahr. Mandaean emigration from Iraq began during Saddam Hussein's rule, but accelerated greatly after the American-led invasion and subsequent occupation. Since the invasion Mandaeans, like other Iraqi ethno-religious minorities (such as Assyrians, Armenians, Yazidi, Roma and Shabaks), have been subjected to violence, including murders, kidnappings, rapes, evictions, and forced conversions. Mandaeans, like many other Iraqis, have also been targeted for kidnapping since many worked as goldsmiths. Mandaeism is pacifistic and forbids its adherents from carrying weapons. The number of Iranian Mandaeans is a matter of dispute. In 2009, there were an estimated 5,000 and 10,000 Mandaeans in Iran, according to the Associated Press. Whereas Alarabiya has put the number of Iranian Mandaeans as high as 60,000 in 2011. Until the Iranian Revolution, Mandaeans had mainly been concentrated in the Khuzestan province, where the community used to exist by side with the local Arab population. They had mainly been practising the profession of goldsmith, passing it from generation to generation. After the fall of the shah, its members faced increased religious discrimination, and many sought a new home in Europe and the Americas. In Iran, the Gozinesh Law (passed in 1985) has the effect of prohibiting Mandaeans from fully participating in civil life. This law and other gozinesh provisions make access to employment, education, and a range of other areas conditional upon a rigorous ideological screening, the principal prerequisite for which is devotion to the tenets of Islam. These laws are regularly applied to discriminate against religious and ethnic groups that are not officially recognized, such as the Mandaeans, Ahl-e Haq, and Baha'i. In 2002 the US State Department granted Iranian Mandaeans protective refugee status; since then roughly 1,000 have emigrated to the US, now residing in cities such as San Antonio, Texas. On the other hand, the Mandaean community in Iran has increased over the last decade, because of the exodus from Iraq of the main Mandaean community, which used to be 60,000–70,000 strong. Following the Iraq War, the Mandaean community dispersed throughout the Middle East. Living as refugees the Mandaeans in Jordan number 49 families, while in Syria there are as many as 1,250 families. There are small Mandaean diaspora populations in Sweden (c. 7,000), Australia (c. 3,500 as of 2006), the USA (c. 2,500), the UK (c. 1,000), and Canada. Sweden became a popular destination because a Mandaean community existed there before the war and the Swedish government has a liberal asylum policy toward Iraqis. Of the 7000 Mandaeans in Sweden, 1,500 live in Södertälje. The scattered nature of the Mandaean diaspora has raised fears among Mandaeans for the religion's survival. Mandaeism has no provision for conversion, and the religious status of Mandaeans who marry outside the faith and their children is disputed. The status of the Mandaeans has prompted a number of American intellectuals and civil rights activists to call upon the U.S. government to extend refugee status to the community. In 2007, The New York Times ran an op-ed piece in which Swarthmore professor Nathaniel Deutsch called for the Bush administration to take immediate action to preserve the community. Iraqi Mandaeans were given refugee status by the US State Department in 2007. Since then more than 2500 have entered the US, many settling in Worcester, Massachusetts. On the 15th of September 2018 the first ever purpose-built Mendi in Europe was consecrated in Dalby, Scania, Sweden. Mandaeans are a closed ethno-religious community, practicing Mandaeism, which is a Gnostic religion:4:4 (Aramaic manda means "knowledge," as does Greek gnosis) with a strongly dualistic worldview. Its adherents revere Adam, Abel, Seth, Enosh, Noah, Shem, Aram and especially John the Baptist. The Mandaeans group existence into two main categories: light and dark. They have a dualistic view of life, that encompasses both good and evil; all good is thought to have come from the World of Light (i.e. lightworld) and all evil from the World of Darkness. In relation to the body–mind dualism coined by Descartes, Mandaeans consider the body, and all material, worldly things, to have come from the Dark, while the soul (sometimes referred to as the mind) is a product of the lightworld. Mandaeans believe the World of Light is ruled by a heavenly being, known by many names, such as “Life,” “Lord of Greatness,” “Great Mind,” or “King of Light”. This being is so great, vast, and incomprehensible that no words can fully depict how awesome Life is. It is believed that an innumerable number of beings, manifested from the light, surround Life and perform cultic acts of worship to praise and honor this great being. They inhabit worlds separate from the lightworld and are commonly referred to as emanations from First Life; their names include Second, Third, and Fourth Life (i.e. Yōšamin, Abathur, and Ptahil ). The Lord of Darkness is the ruler of the World of Darkness formed from dark waters representing chaos. A main defender of the darkworld is a giant monster, or dragon, with the name “Ur;” an evil, female ruler also inhabits the darkworld, known as “Ruha”. The Mandaeans believe these malevolent rulers created demonic offspring who consider themselves the owners of the Seven (planets) and Twelve (Zodiac signs). According to Mandaean beliefs, the world is a mixture of light and dark created by the demiurge (Ptahil) with help from dark powers, such as Ruha, the Seven, and the Twelve. Adam’s body (i.e. believed to be the first human created by God in Christian tradition) was fashioned by these dark beings; however, his “soul” (or mind) was a direct creation from the Light. Therefore, many Mandaeans believe the human soul is capable of salvation because it originates from the lightworld. The soul, sometimes referred to as the “inner Adam” or “hidden Adam,” is in dire need of being rescued from the Dark, so it may ascend into the heavenly realm of the lightworld. Baptisms are a central theme in Mandaeanism, believed to be necessary for the redemption of the soul. Mandaeans do not perform a single baptism, as in religions such as Christianity; rather, they view baptisms as a ritualistic act capable of bringing the soul closer to salvation. Therefore, Mandaeans get baptized repeatedly during their lives. John the Baptist is a key figure for the Mandaeans; they consider him to have been a Mandaean (2015). John is referred to as a “disciple” or “priest,” most known for the countless number of baptisms he performed, which helped close the immense gap between the soul and salvation. Today, many Mandaeans are refugees and are not willing to accept converts into their religion. Sunday, as in other religious traditions, is their holy day, centered largely on mythical beliefs. Some Mandaeans consider Jesus an “apostate Mandaean”. The Mandaic language is an eastern dialect of Aramaic, although its alphabet is unique. It has mainly survived as a liturgical language. ^ Iraqi minority group needs U.S. attention, Kai Thaler,Yale Daily News, March 9, 2007. ^ "Disciples of John the Baptist also flee ISIS - Inter Press Service". ^ a b c d e f Contrera, Russell. "Saving the people, killing the faith – Holland, MI". The Holland Sentinel. Archived from the original on March 6, 2012. Retrieved December 17, 2011. ^ "Jordan's Mandaean minority fear returning to post-ISIS Iraq". The National. June 9, 2018. Retrieved June 9, 2018. ^ Siobhan Hegarty (July 21, 2017). "Meet the Mandaeans: Australian followers of John the Baptist celebrate new year". ABC. Retrieved July 22, 2017. ^ Rudolph 1977, p. 5. ^ Deutsch 1999, p. 4. ^ a b Rudolph 1977, p. 4. ^ a b Zurutuza, Karlos (29 January 2012). "The Ancient Wither in New Iraq". IPS. Archived from the original on 31 January 2012. Retrieved 5 June 2012. ^ Buckley, Jorunn Jacobsen. "Mandaean Community in Iran". Encyclopedia Iranica. Retrieved June 5, 2012. ^ "MANDAEANS iv. COMMUNITY IN IRAN". Encyclopaedia Iranica. ^ a b c d Ekman, Ivar (April 9, 2007). "An exodus to Sweden from Iraq for ethnic Mandaeans". The New York Times. Retrieved May 12, 2010. ^ a b Newmarker, Chris (February 10, 2007). "Survival of Ancient Faith Threatened by Fighting in Iraq". The Washington Post. Retrieved May 12, 2010. ^ Lupieri 2002, p. 91. ^ a b Iraq's Mandaeans 'face extinction', Angus Crawford, BBC, March 4, 2007. ^ a b Deutsch, Nathaniel (October 6, 2007). "Save the Gnostics". The New York Times. ^ a b "Iran Mandaeans in exile following persecution". Alarabiya.net. December 6, 2011. Retrieved December 17, 2011. ^ "Ideological Screening (ROOZ :: English)". ^ Annual Report for Iran Archived 2011-02-18 at the Wayback Machine, 2005, Amnesty International. ^ Updated 33 minutes ago 12/17/2011 8:29:41 AM +00:00 (January 7, 2009). "Ancient sect fights to stay alive in U.S. - US news – Faith – msnbc.com". MSNBC. Retrieved December 17, 2011. ^ a b "Morgondopp som ger gruppen nytt hopp" (in Swedish). ^ Newmarker, Chris (February 10, 2007). "Survival of Ancient Faith Threatened by Fighting in Iraq". Associated Press. ISSN 0190-8286. Retrieved July 9, 2018. ^ The Plight of Iraq's Mandeans Archived 2011-06-29 at the Wayback Machine, John Bolender. Counterpunch.org, January 8/9, 2005. ^ Ekman, Ivar (April 9, 2007). "An exodus to Sweden from Iraq for ethnic Mandaeans". iht.com. International Herald Tribune. Retrieved July 9, 2018. ^ Mandaeans persecuted in Iraq. ABC Radio National (Australia), June 7, 2006. ^ Ekman, Ivar (April 9, 2007). "An exodus to Sweden from Iraq for ethnic Mandaeans". The New York Times. Retrieved May 12, 2010. ^ "These Iraqi immigrants revere John the Baptist, but they're not Christians". Public Radio International. Retrieved December 15, 2017. ^ Nyheter, SVT (September 15, 2018). "Nu står mandéernas kyrka i Dalby färdig". SVT Nyheter (in Swedish). Retrieved December 1, 2018. ^ a b c d e f g Rudolph 2001. ^ a b c McGrath 2015. Jorunn Jacobsen Buckley, The Mandaeans: Ancient Texts and Modern People, New York: Oxford University Press 2002. Jorunn Jacobsen Buckley, The Great Stem of Souls: Reconstruction Mandaean History, Piscataway: Gorgias Press, 2005. Deutsch, Nathaniel (1999). Guardians of the Gate: Angelic Vice-regency in the Late Antiquity. BRILL. ISBN 9004109099. Ethel Stefana Drower, The Mandaeans of Iraq and Iran (1937), reprint: Piscataway: Gorgias Press, 2002. Ethel Stefana Drower, The Secret Adam: A Study of Nasoraean Gnosis, Oxford: Clarendon, 1960. Edmondo Lupieri, The Mandaeans: The Last Gnostics, Grand Rapids: Eerdmans, 2002. Rudolph, Kurt (1977). "Mandaeism". In Moore, Albert C. (ed.). Iconography of Religions: An Introduction. 21. Chris Robertson. ISBN 9780800604882. Rudolph, Kurt (June 20, 2001). Gnosis: The Nature and History of Gnosticism. A&C Black. pp. 343–366. ISBN 9780567086402. Andrew Phillip Smith, John the Baptist and the Last Gnostics: The Secret History of the Mandaeans, London: Watkins Publishing 2016. Edwin M. Yamauchi, Mandaic Incantation Texts (1967), reprint Piscataway: Gorgias Press, 2005. Edwin M. Yamauchi, Gnostic Ethics and Mandaean Origins (1970), reprint Piscataway: Gorgias Press, 2004. This page was last edited on 23 March 2019, at 23:10 (UTC).